Bleached corals: Image credit & copyright Paul MarshallAs scientists and conservationists race to work out the best way to conserve the world’s coral reefs, a new study reveals why some reefs appear to be more resistant to coral bleaching during ocean warming events and calls for higher-resolution data to be collected. The authors, from a number of American Universities and Bangor University in the UK, writing in Nature Communications utilise data collected from 118 coral reef locations globally. They illustrate how reefs over very small distances - as little as tens or hundreds of meters of each other, can be subject to different daily sea temperature changes - based on their depth and their position on the reef. 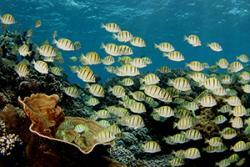 These reefs end up having different fates during ocean warming events. Reefs subjected to high sea temperature fluctuations on daily or tidal timescales leading up to the ocean warming event are better able to resist coral bleaching, such that a 1⁰C increase in daily temperature range reduces the odds of more severe bleaching by a factor of 33. A healthy coral reef. 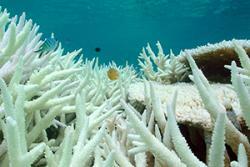 : Image credit & Copyright: Brian Zgliczynski“Rising ocean temperatures and ocean warming events driven by global climate change represent the greatest current threat to the integrity of coral reef ecosystems worldwide” says co-author Gareth Williams of Bangor University’s School of Ocean Sciences. “These warming events have become more frequent and are projected to keep increasing in frequency in the coming decades” says Williams.